Moscow, March 11, Interfax – Moscow welcomes the release of the Orthodox nuns and their female aides from the convent of Mar Takla in the Syrian town of Maaloula and notes the role of the Lebanese and Qatari special services in this operation, the Russian Foreign Ministry posted a statement on Tuesday. “Moscow welcomes the release of the Orthodox nuns, which we have supported strongly and constantly at various levels. We give dues to the humane decision made by the Syrian leadership and the efficient role, which the Lebanese and Qatari special services played in this case,” the document said. “We are urging all the parties, which can influence the events in Syria, to activate work aimed at resolving various aspects of the Syrian crisis, including the release of foreigners and Syrian nationals kidnapped by rebels in Syria. In our turn, we continue relevant persistent efforts aimed at the release of Russian citizens Zhuravlyov and Gorbunov, Orthodox and Syro-Yakovit Metropolitans of Aleppo Pavel Yazigi and Yohanna Ibrahim, Catholic priest Paolo Dall’Oglio and other person being held illegally,” the Foreign Ministry said. 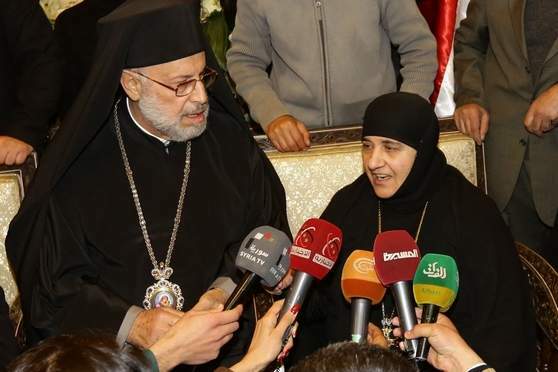 In December 2013, 13 nuns and their three female aides were kidnapped by insurgents of the al-Nusra Front and moved to the rebel-controlled town of Yabroud in the Qalamoun region near the border with Lebanon, the statement said. “Amid the conditions, when government forces almost encircled Yabroud, militants accepted the proposal and in exchange delivered through mediators, under the conditions of which the Syrian authorities released a group of women detained previously on the accusations of being involved in the activities of the armed opposition. This exchange took place on March 9-10,” the statement said.